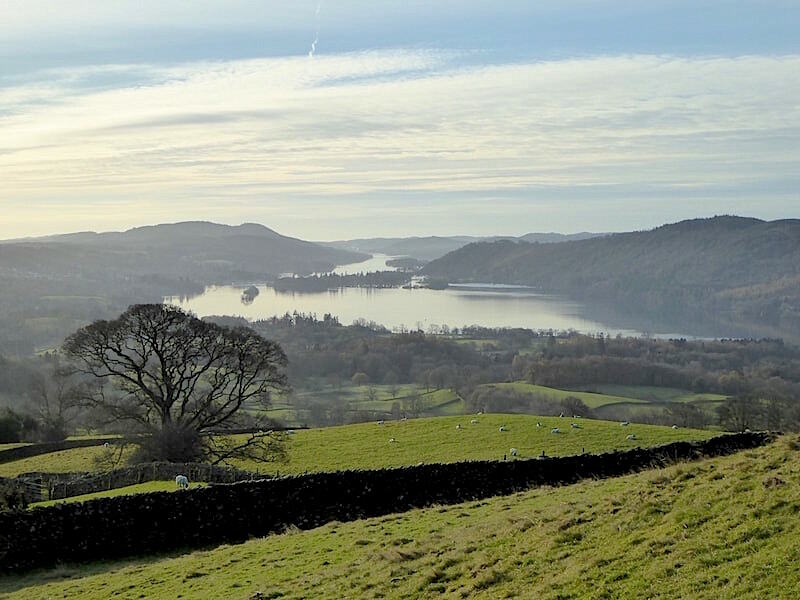 The forecast of a dry and wind free day, together with the promise of some sparkling morning sunshine before cloud would begin to build towards midday, had us nipping along Ullswater, up the Kirkstone Pass and down to Church Bridge at Troutbeck for a sunny circular walk over Wansfell. 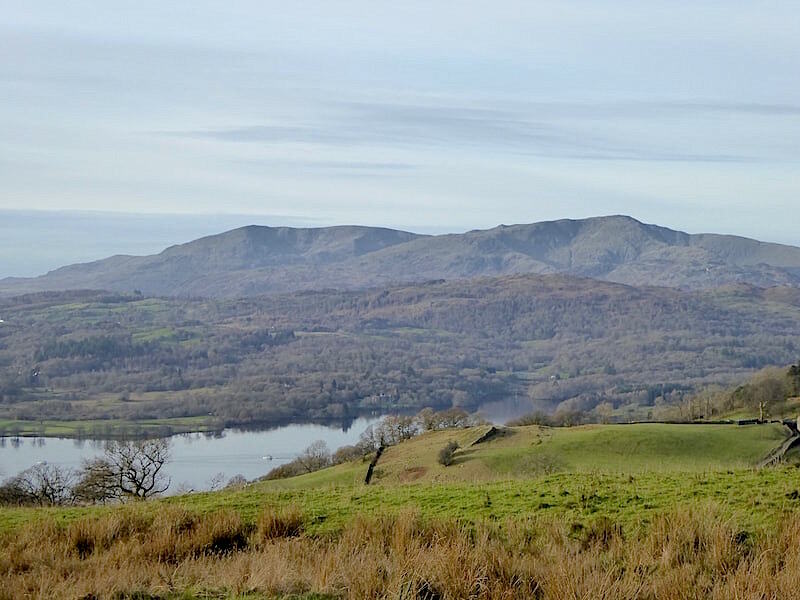 There was a hard frost last night so there was some ice scraping to do on the car before we could get going, and we were hoping that the overnight conditions would mean that the soggy sections on and around Wansfell would have resulted in some firm and frosty ground to walk over. Only a couple of cars already parked up in the little parking area below the church when we arrived. 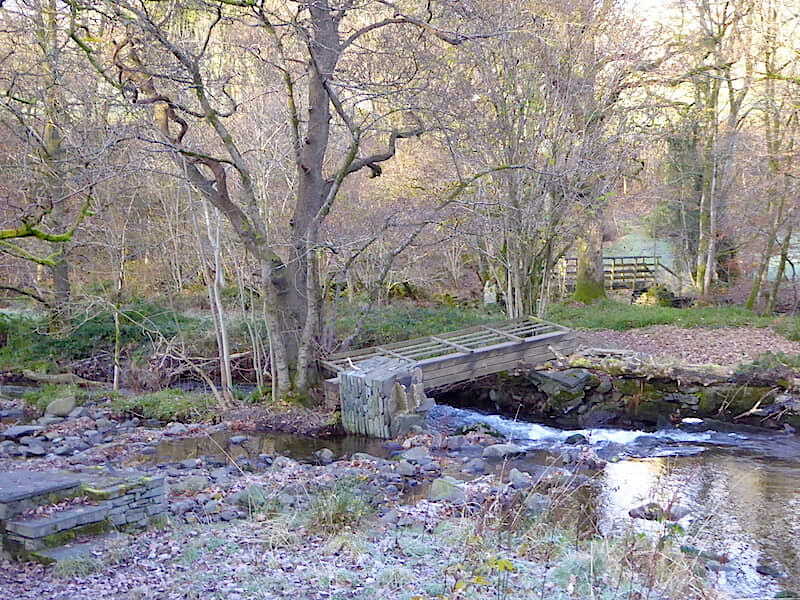 Well wrapped up in winter gear against the chill and the shade we cross Trout Beck by the footbridge which runs alongside the road bridge. 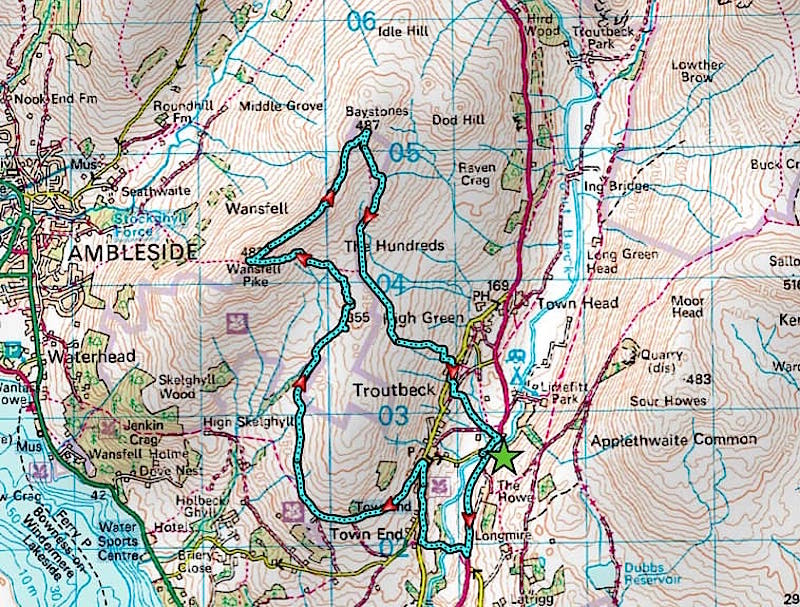 The sun hasn’t yet appeared above the rim of Sour Howes to the east of us so we’ll be walking in the shade for a while as we walk southwards on the footpath alongside the A592. 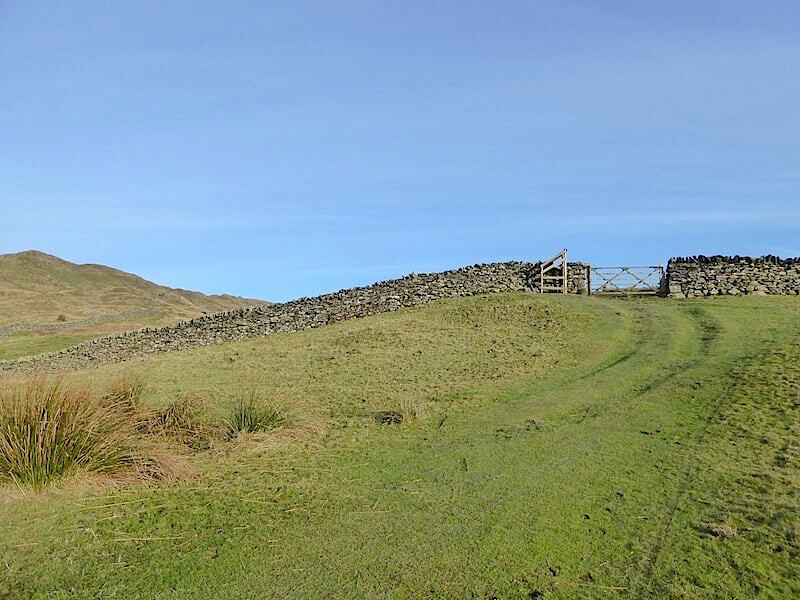 A short distance further on and we pass the start of the Garburn Pass road but that’s not for us this morning. 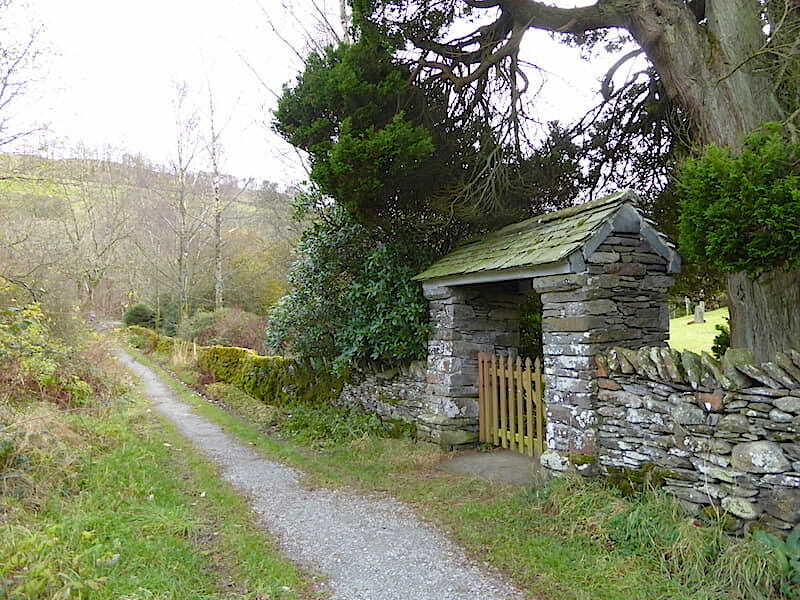 We carry on along the roadside footpath until we come to a wooden gate by a bus stop, which has a footpath sign attached to it. 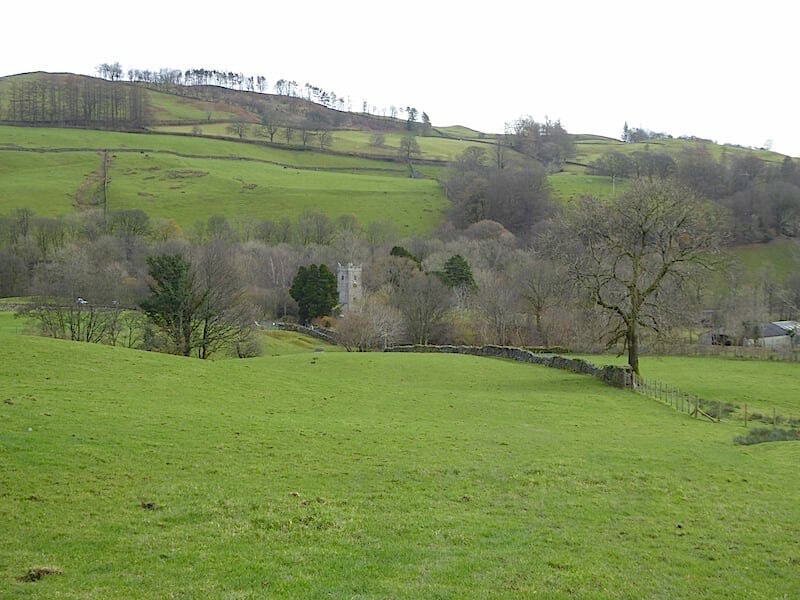 The view down the path as we pass through the gate and head down to Trout Beck at the bottom of the shaded valley. A coating of frost lies over the grass, the leaves are dry and crisply frosted but the path itself is firm underfoot and ice free. Well, here’s a pretty kettle of fish, as the old saying goes. 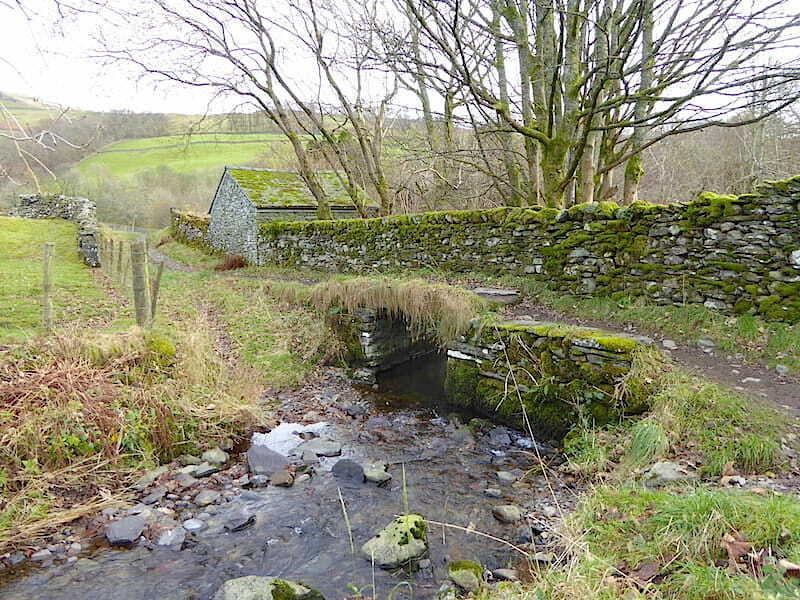 The bridge is still lying where it rested following the Storm Desmond floods and the beck is full and fast flowing so no chance of using any beck stones to cross. 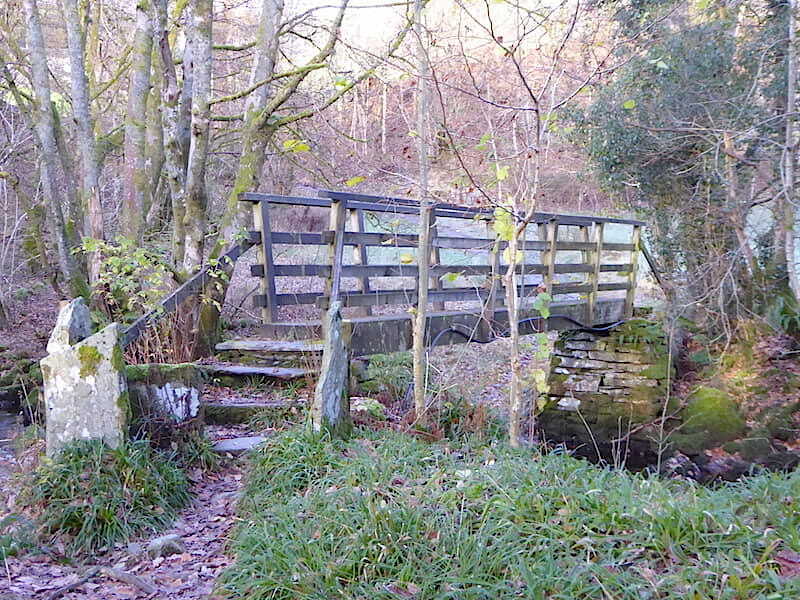 There was no indication back at the start of the path that the bridge was out of commission, although it wouldn’t have deterred us if there had been. Many notices remain in situ even when the problem has been rectified so you can’t always take them at face value. We review the situation, give the bridge a thorough going over, i.e. a bit of a shove, fill in the risk assessment forms and then get on with it. A cheery wave from my intrepid sidekick as he inched his way across amid much hilarity. Walking upright across it didn’t seem particularly sensible. Although it was firmly wedged between two trees, with a tree trunk acting as a buttress, and definitely not going anywhere, it had come to rest at a slight angle and the wooden blocks and rails had a thin icy coating. Not entirely confident that boot soles would grip firmly, or that balance could be maintained we opted for the all fours method. This is the full frontal approach whereas mine was more of a crab like sideways shuffle. Normal service resumed at the second bridge and we completed our second crossing of Trout Beck today without further ado. Once across we began to see notices about the fallen bridge as we walked up the path to Town End. 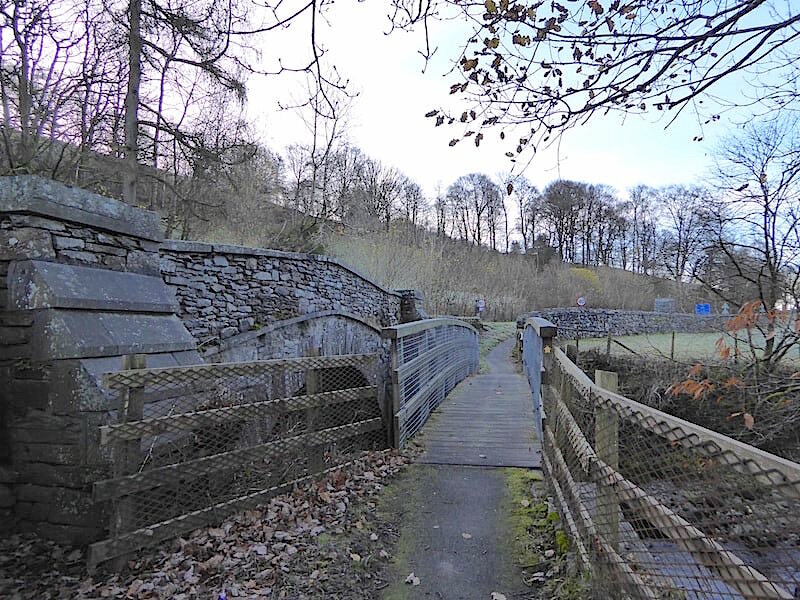 Across the bridge the path leads us up to Town End, at the southern end of Troutbeck village, and out into the sunshine. 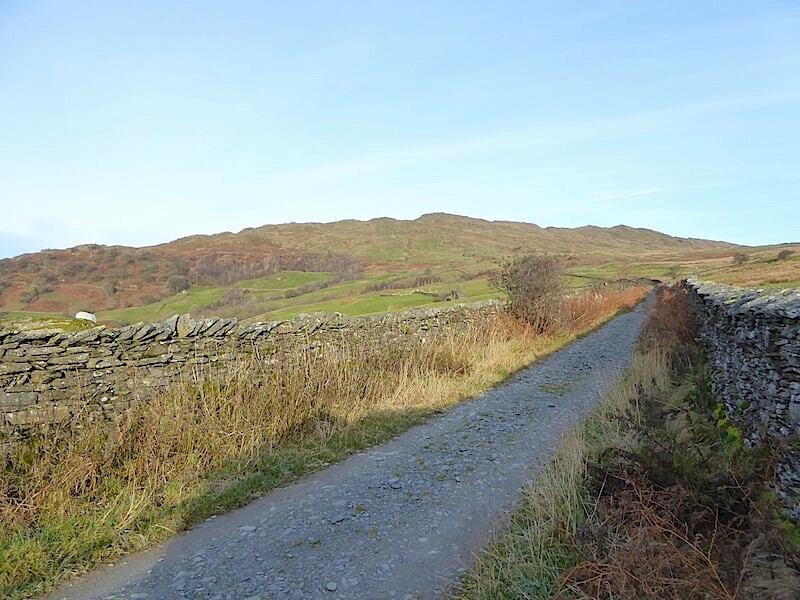 When the path joined the road we could have turned left and walked on to Fell Lane at the end of which we would have joined the Robin Lane path. 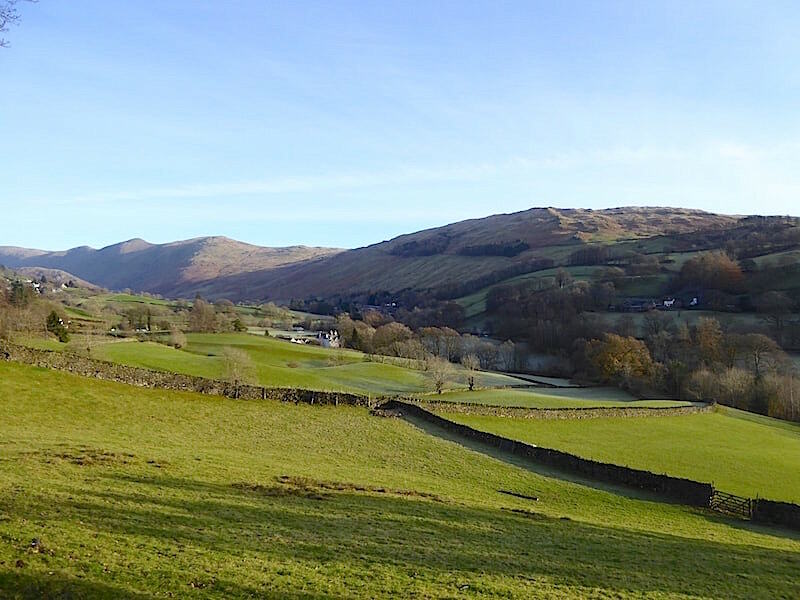 As we’d decided to have a walk up to Troutbeck before starting out for Wansfell we turned right instead and began walking up the hill towards the village. 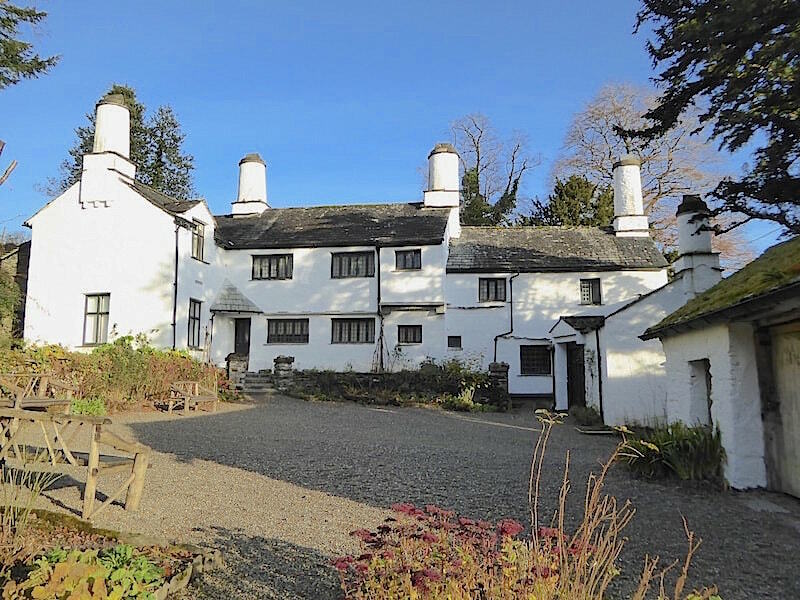 On our left is Townend, a Grade 1 listed 17th century farmhouse once owned by the Browne family and now owned by The National Trust. We couldn’t pay a visit as its closed now until February 2018. 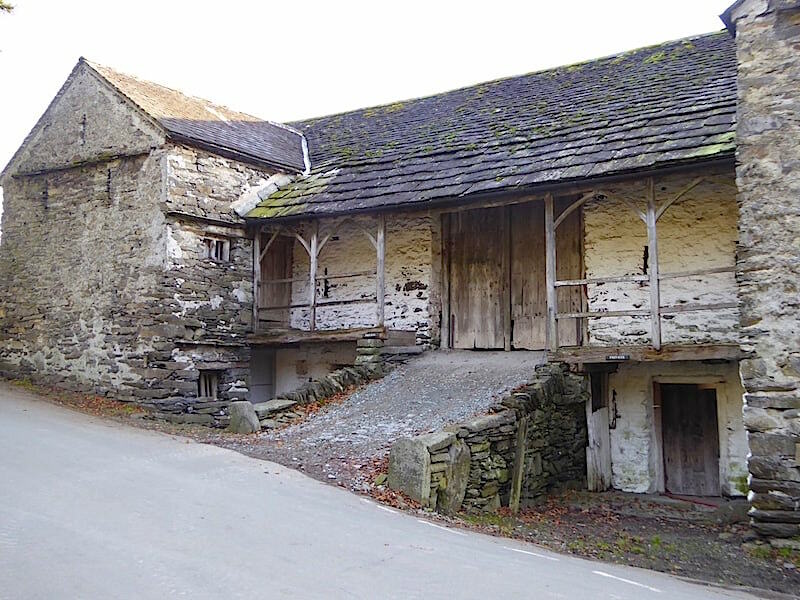 Immediately across the road from the house is this tradtional bank barn built by George Browne in 1666. 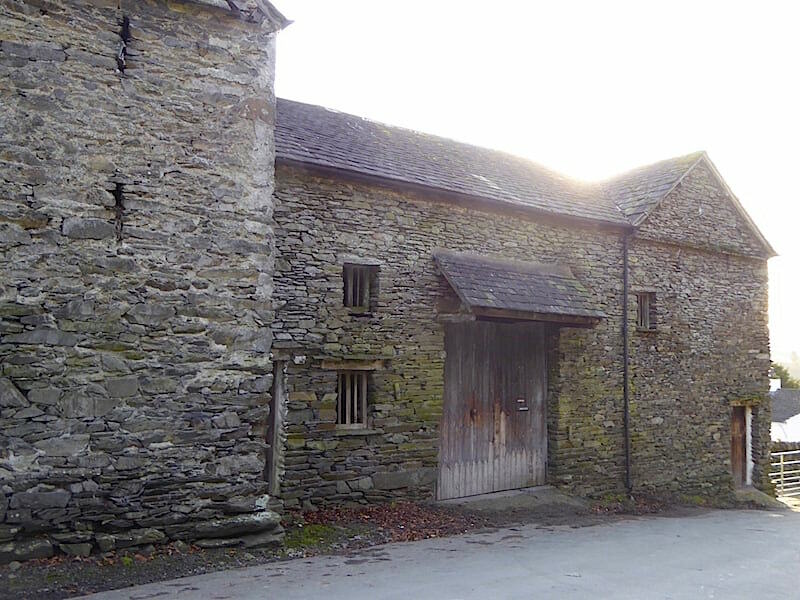 The other end of the barn is an 18th century addition. The barn is still in use by a local farmer. 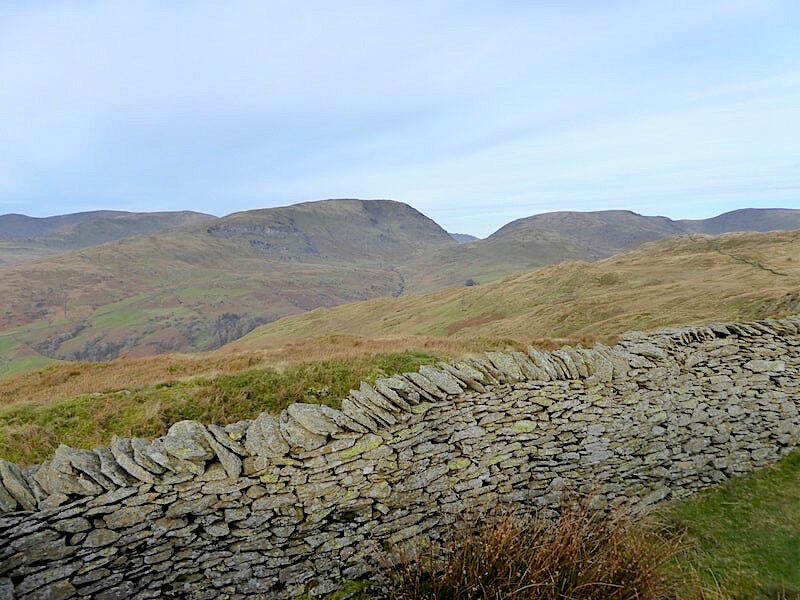 A view over the wall of the lovely Troutbeck Valley with Sour Howes to the right and the western arm of the Kentmere Horseshoe on the left. 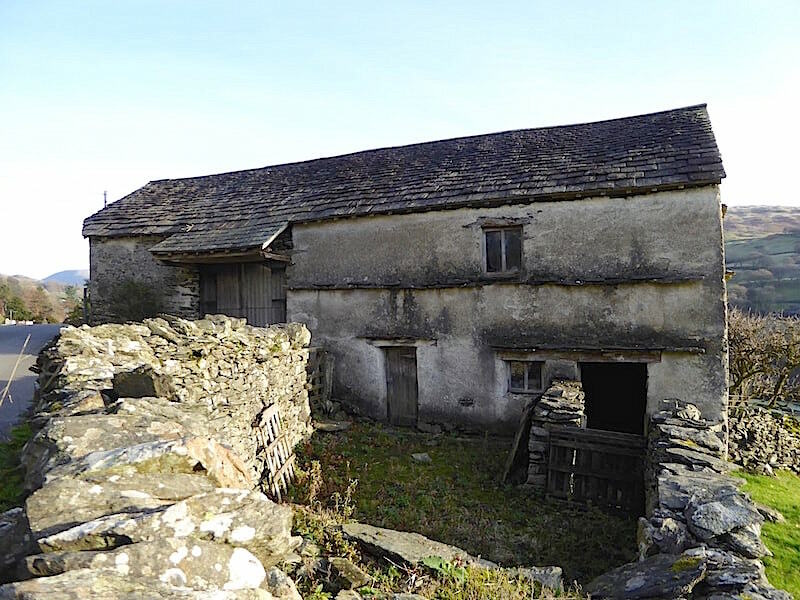 Further along is another very old building, with an attached barn, looking very much worse for wear. I thought about life as it was when it was built and the hardship and poverty which sprang to mind didn’t bear thinking about. 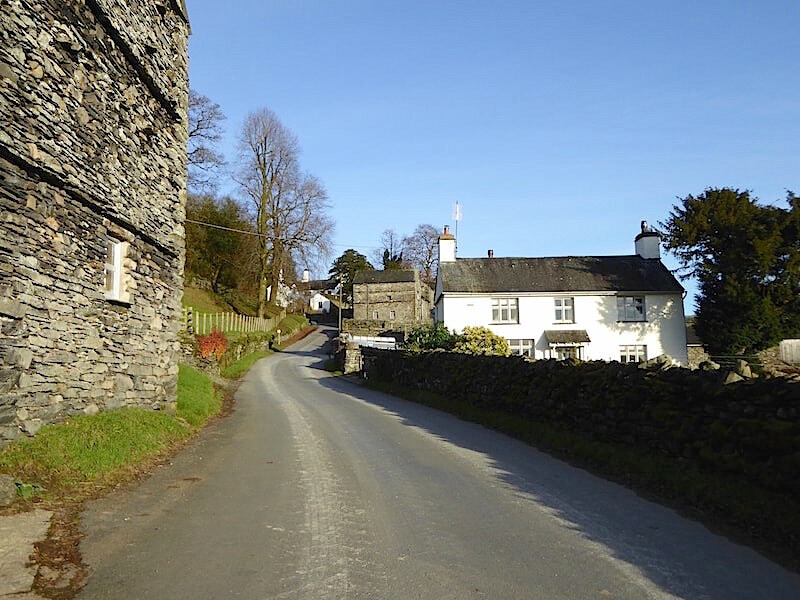 We continued on up the hill and then turned left onto Robin Lane at the village shop / tea room / part time Post Office. 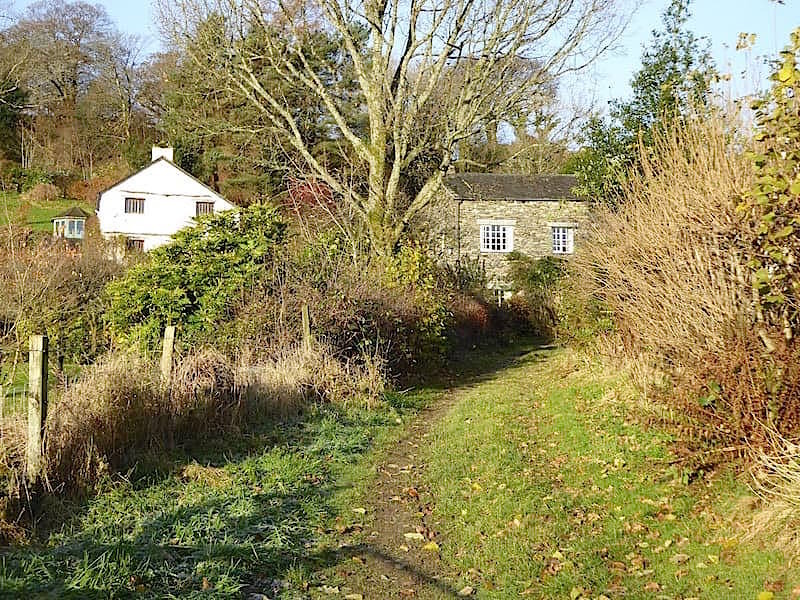 We leave the village behind and take a steady walk up Robin Lane, where its such an enjoyable, and very welcome, change to have a dry and solid path beneath our feet after all the this year’s wetness. 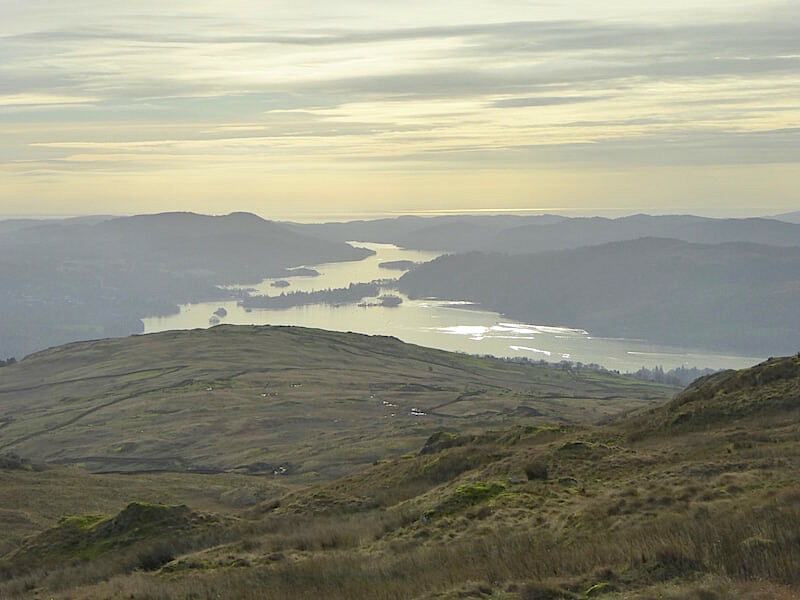 We had a brief pause to take in this lovely view of Windermere in the hazy morning sunlight. Apart from passing the time of day with a lady sweeping her front yard further back down the lane, and a brief hello with a lady runner coming towards us, we’ve encountered no-one else so far and it was as quiet and peaceful as you could wish for. 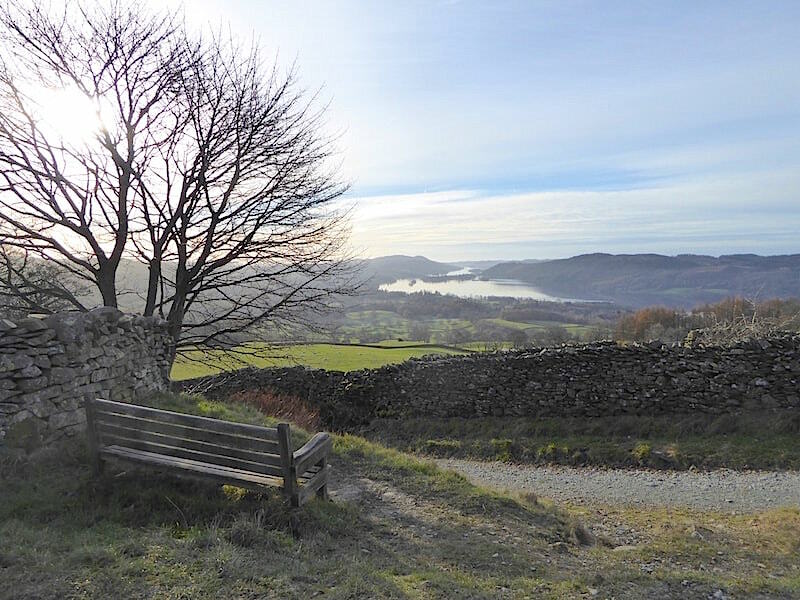 A seat from which to enjoy the view of Windermere. 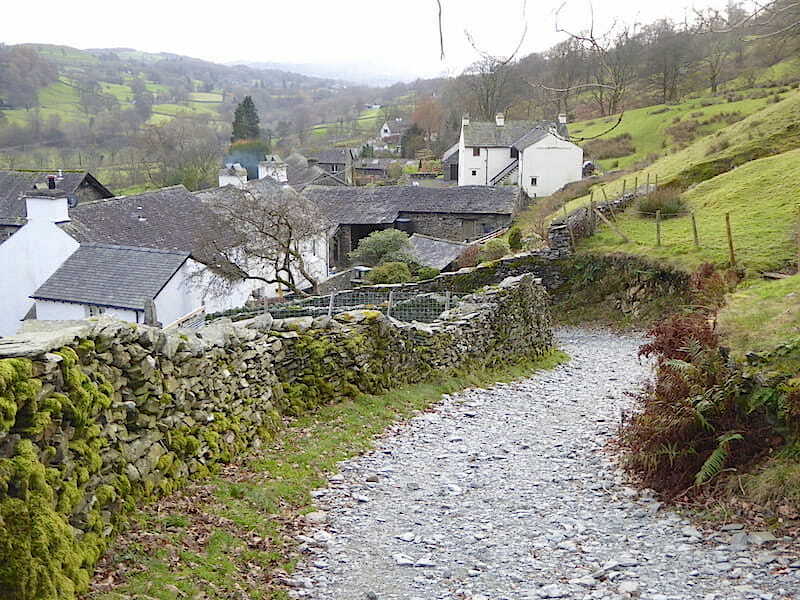 The lane in front of it is Fell Lane which we could have walked up from Town End instead of going up to Troutbeck first. 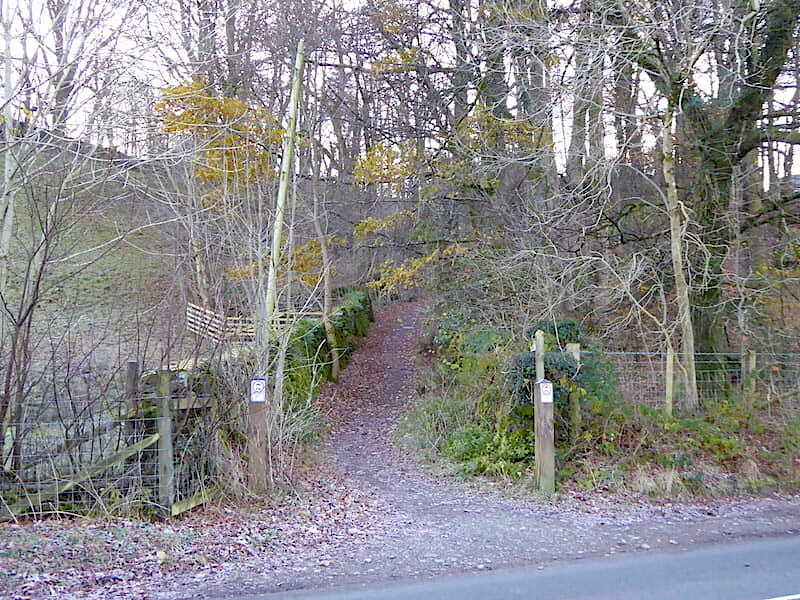 We carry on along Robin Lane where, on the right, a stone pillar sits atop the small hill. A little further along this step stile allows access across the field to the pillar but we didn’t go over for a closer look. 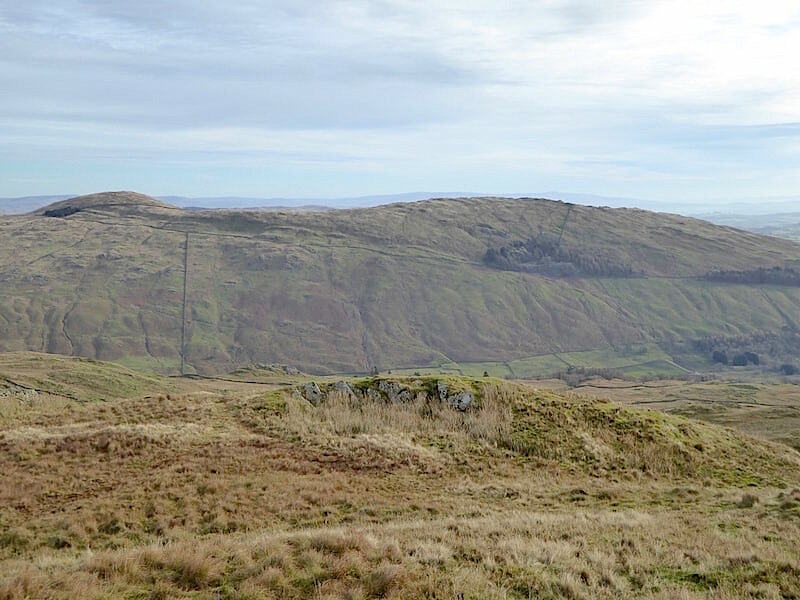 Apparently it is an old siting pillar thought to have been used in the construction of the Thirlmere aqueduct. 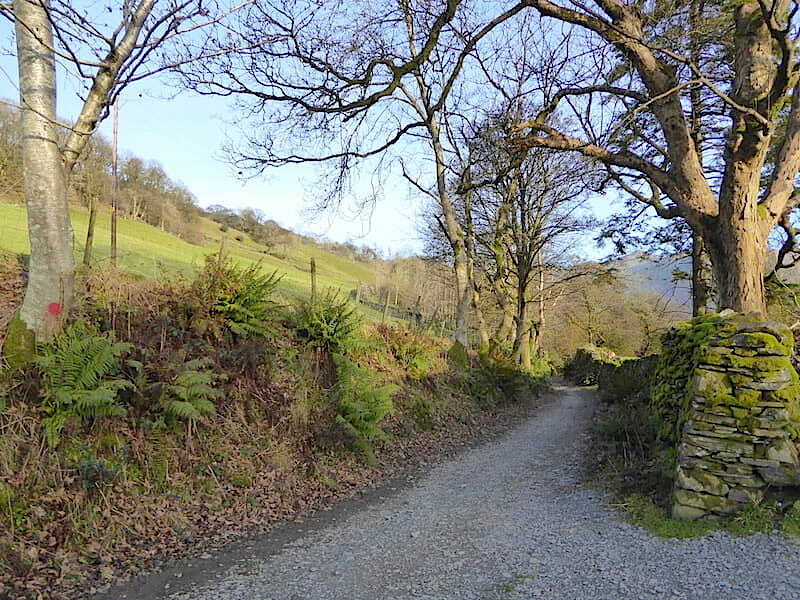 At this point we take our leave of Robin Lane which continues on beyond the gate and back down to Ambleside. 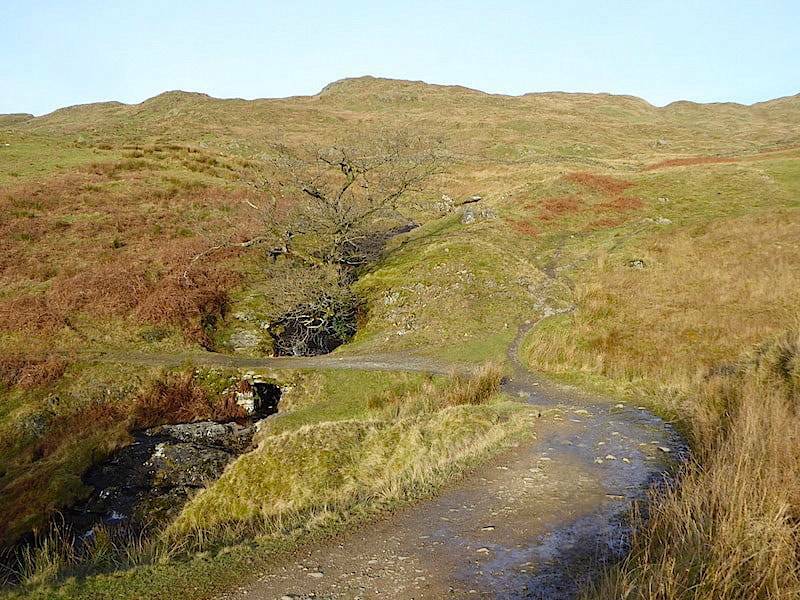 We take the right hand turning by the signpost onto Hundred Lane and continue on towards Wansfell. 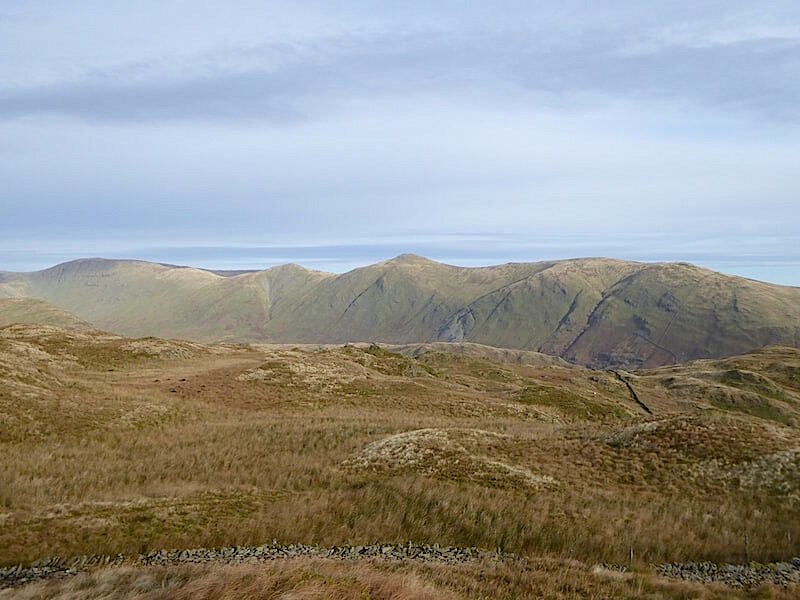 The Wansfell ridge from the lovely old track known as Hundred Lane …..
….. and over to our left are Coniston Old Man and Wetherlam. A look back along our route so far along Hundred Lane as we stop to remove our jackets. The sun is blazing down on our backs, there isn’t a breath of wind and we definitely do not need to be wearing insulated jackets. We keep the fleece mid layers on though, its certainly not hot enough to be down to t-shirt level. 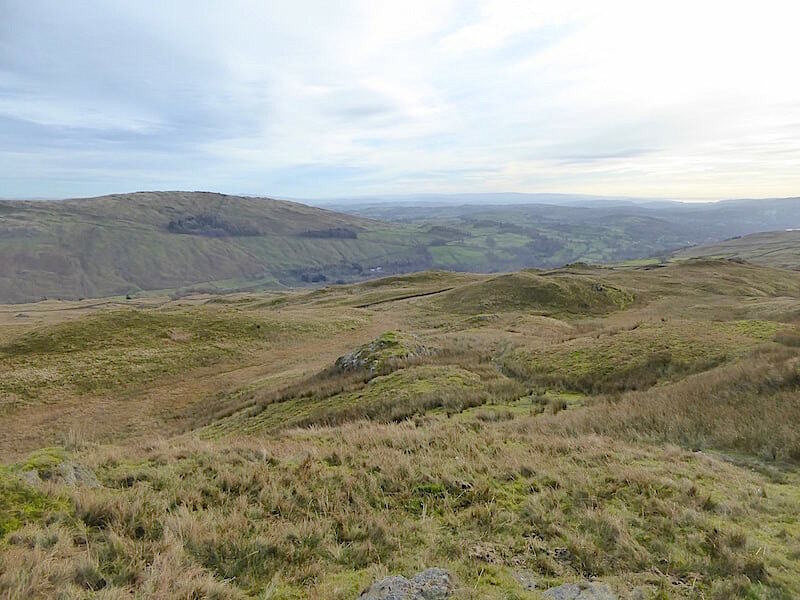 As you can see there is no-one else around, this is one of the quieter routes on Wansfell and all the more enjoyable for that. When the track curves left to cross over Hol Beck we turn off to the right, just before the little bridge, and begin climbing the waymarked path. We’ll be back on grass again soon so we hoped the ground would still be frozen and solid despite the sun being on it all morning. 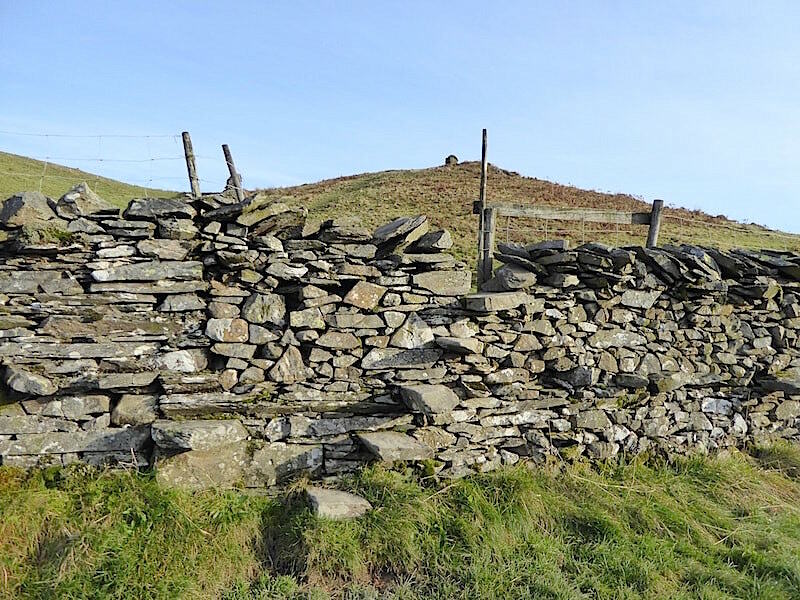 A steady pull up over various humps and bumps brings us to the wall. 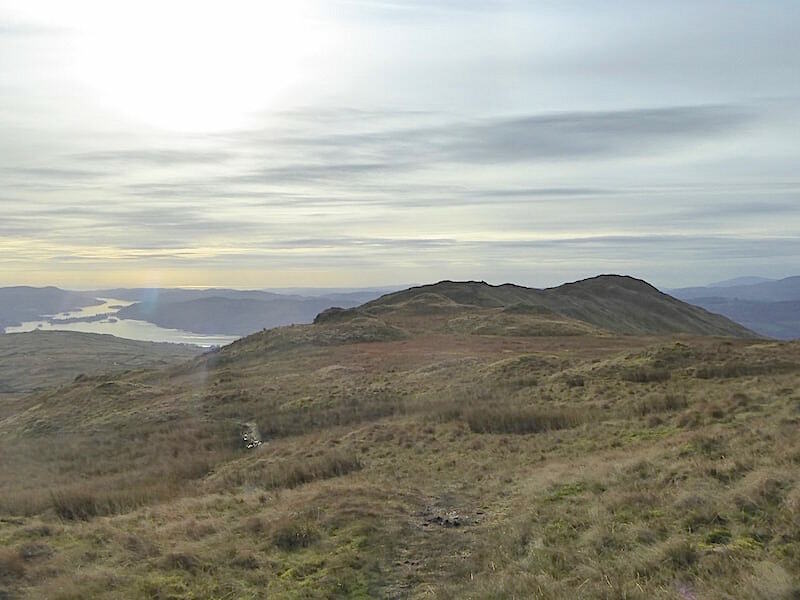 Only one person came by us on the way up, a thirty something chap, not carrying a pack or wearing running gear, who was walking quite quickly so maybe he was doing a bit of speed walking. 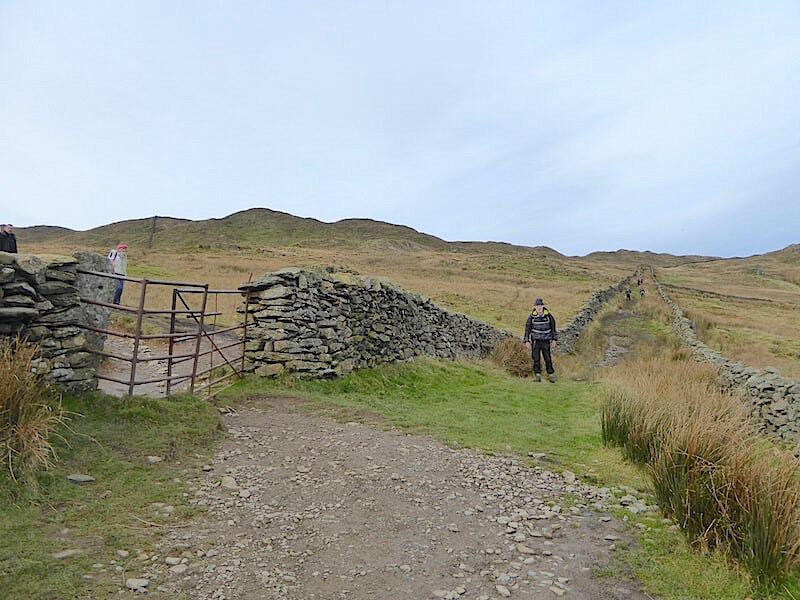 The gate was padlocked so the step stile alongside it, with its unusual support structure complete with handrail, was the only option. It wasn’t very weathered either so its probably a fairly recent addition. 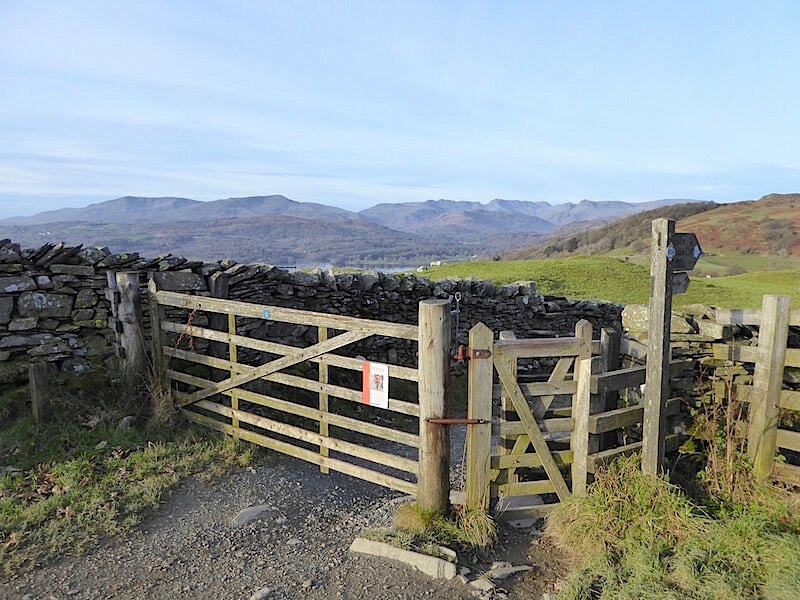 Its not often we come across padlocked gates and this was the second one of the morning so it was a bit out of the ordinary. If the purpose was to deter cyclists it hadn’t succeeded as bike wheel marks are clearly visible. 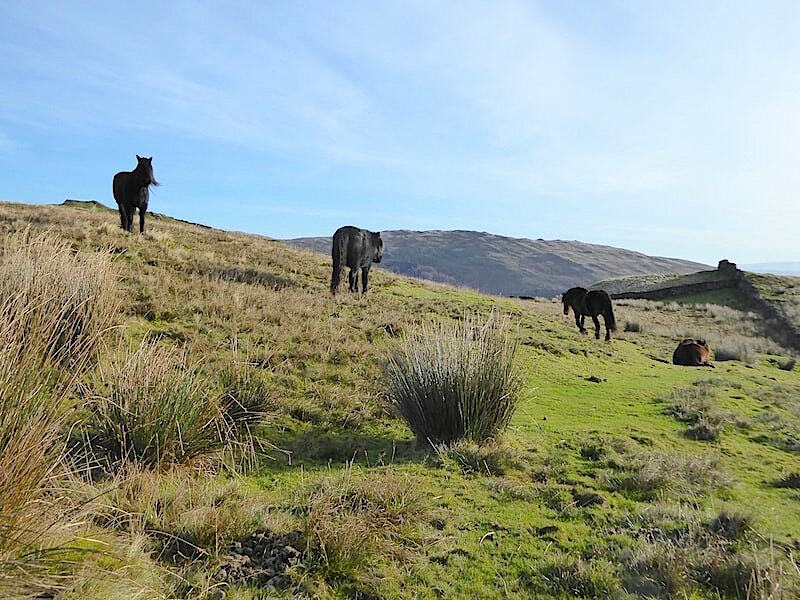 Once over the wall we spend a minute or three with the fell ponies. They were happy for us to be close to them but turned their noses up at the handful of grass we offered a couple of them, even though it was the same grass they were getting for themselves. I bet they wouldn’t have been quite so choosy if we had offered them Polo mints. 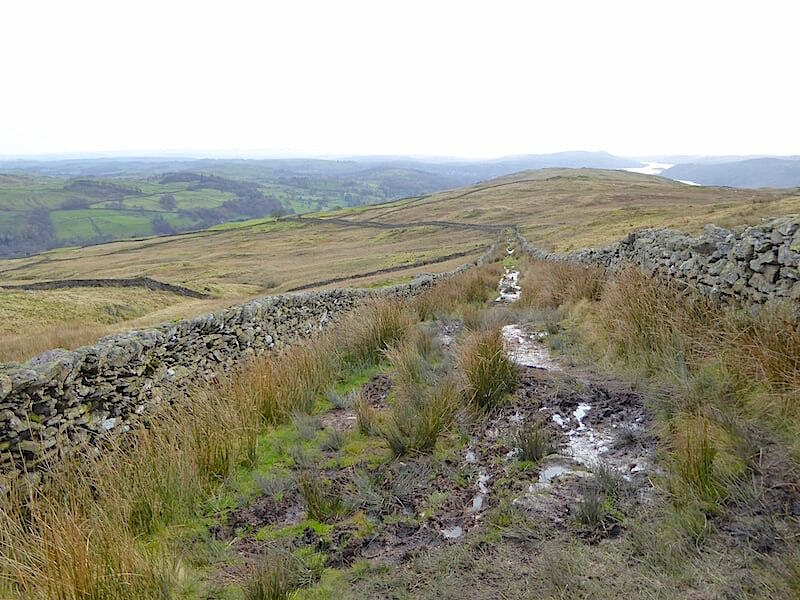 The wettest part of the route is across this flattish area below the Wansfell ridge and the chap who passed us a little further back is now of shot on the left, following the path which comes up from Nanny Lane. I know we spent a few minutes with the fell ponies but even so he’s covered quite a lot of ground in the meantime. He must have just ploughed on regardless through all this marshy ground without worrying too much about getting wet feet. Last night’s frost wasn’t severe enough to provide a completely firm, dry walk across but on the whole it wasn’t too bad. 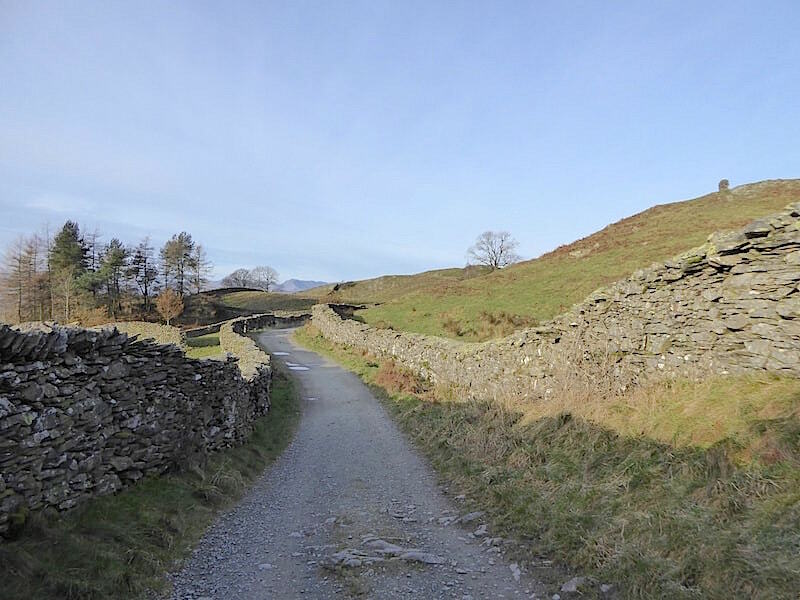 The Nanny Lane path, which passes through the wall, was very busy today, as was the route coming up from Stockghyll on the western side of the fell. Crowded and noisy paths are not my cup of tea at all, I simply don’t enjoy being in a long queue of walkers. 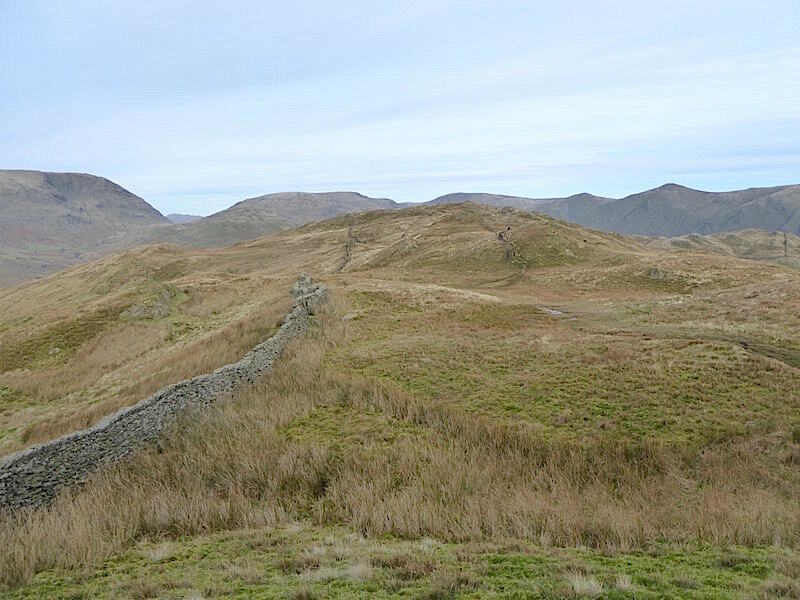 We moved off the path to some nearby outcrops and had a Mars Bar break while the next straggling line of walkers passed by, and when there was a longish gap in the traffic we set off again. 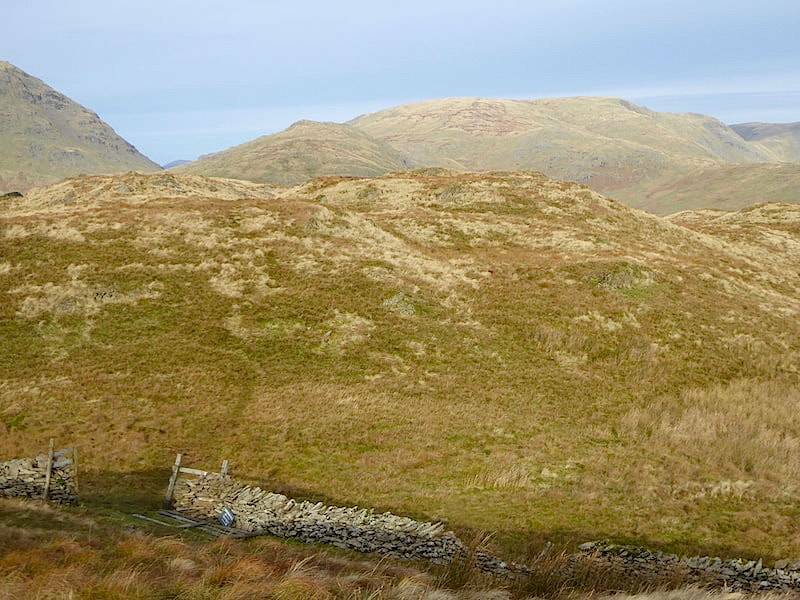 A look back at Sour Howes, with Sallows just peeping up behind it, as we make our way up to the ridge line. 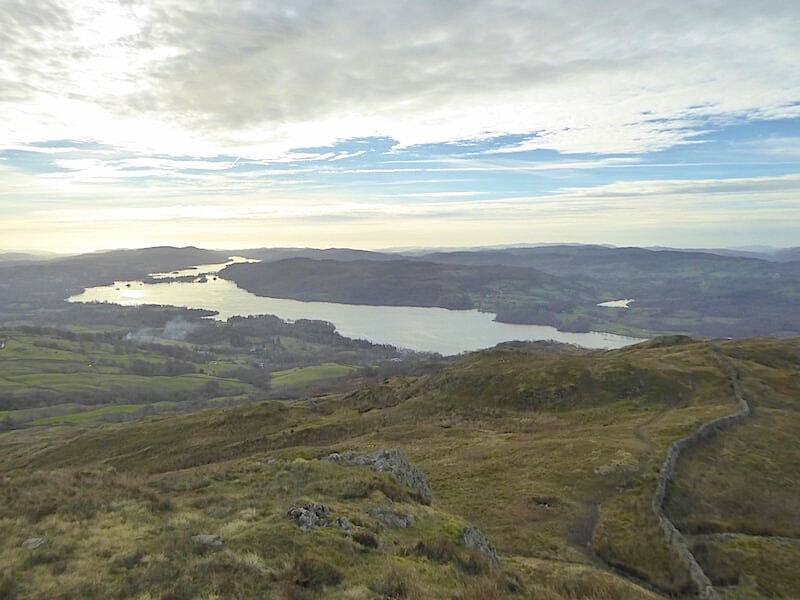 We reach the ridge and the summit of Wansfell Pike, a subsidiary top of Wansfell. 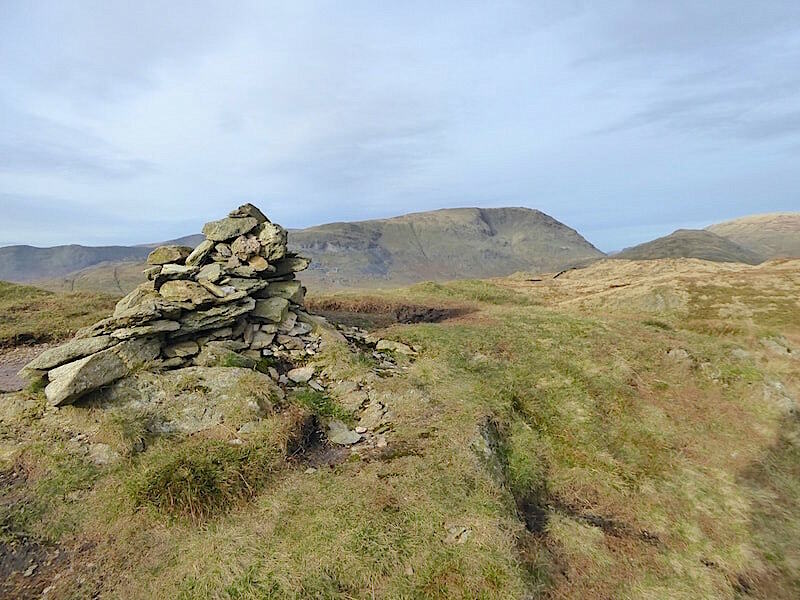 The true summit of Wansfell is Baystones, which lies further along the ridge to the north and is about 16′ higher than the Pike, although it doesn’t have quite as good views. There were crowds of folk up here today, not surprising since its a nice day and its Sunday, so it was a bit of a job to take any shots which didn’t have anyone in them. 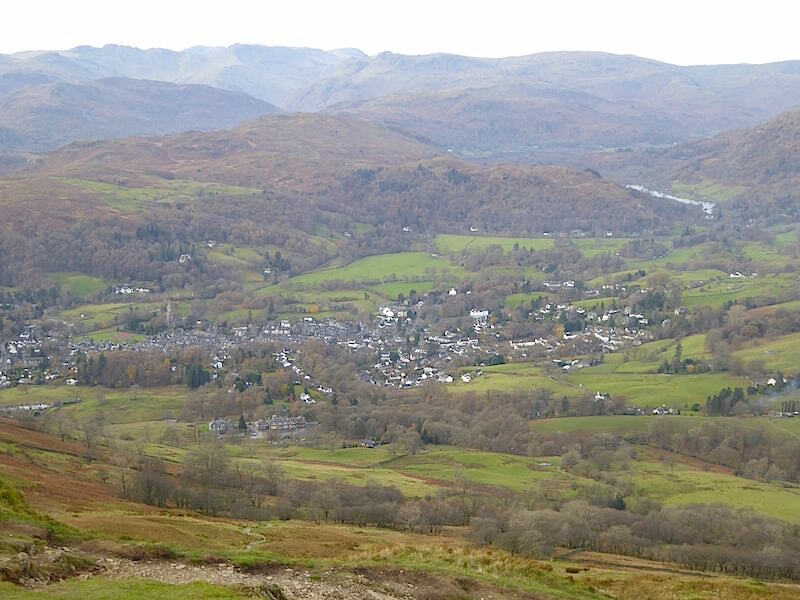 Here I’m looking over towards the southern fells …..
….. and the view of Windermere to the south, as predicted the cloud is beginning to creep in …..
….. although its still relatively clear over Red Screes, Caudale Moor, Thornthwaite Crag, Froswick and Ill Bell, left to right respectively on the skyline …..
….. while down below is Ambleside which will be as busy as it always is I suppose. 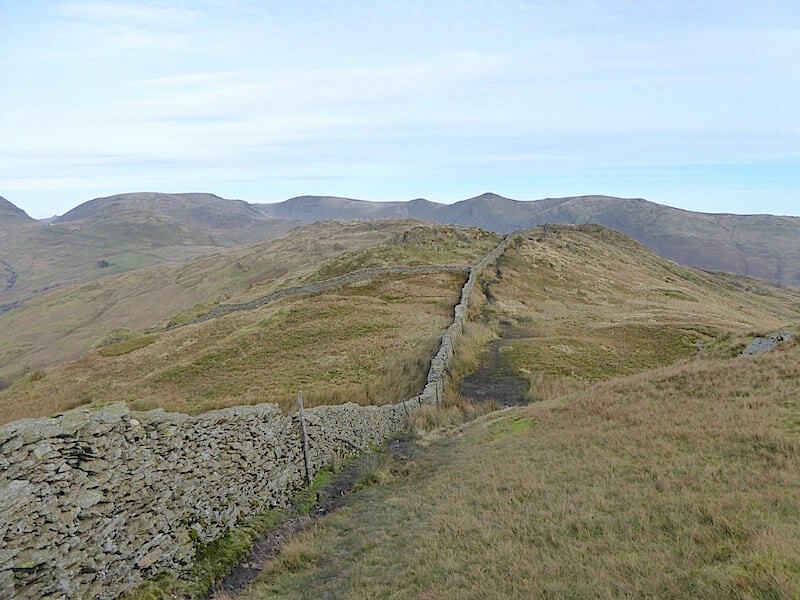 We leave the hustle and bustle of the Pike and begin making our way over the switchback path alongside the wall towards Baystones. 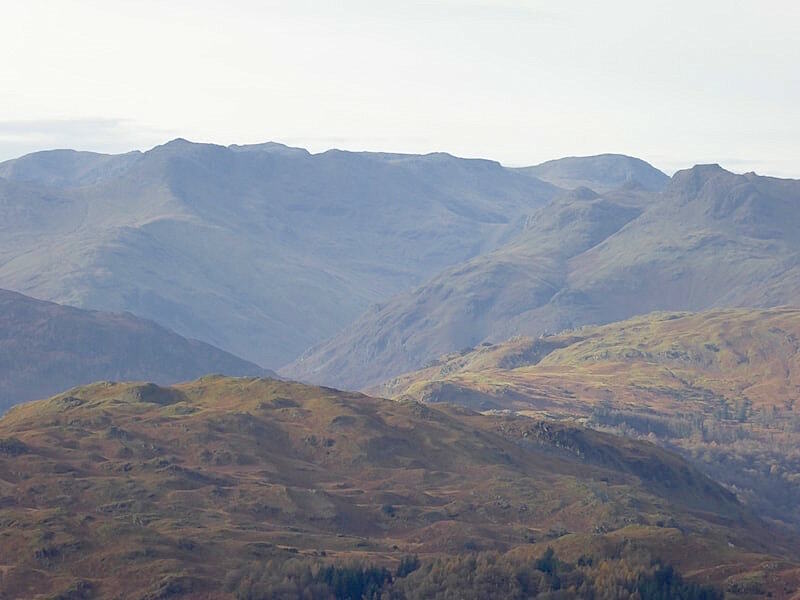 A spell of sun penetrated the cloud layer and gave us this rather smoky view of a good number of the southern fells, too many to name individually but Bowfell and Scafell Pike are prominent to the left of the centre skyline, with Great End and the Langdale Pikes on the extreme right of it. 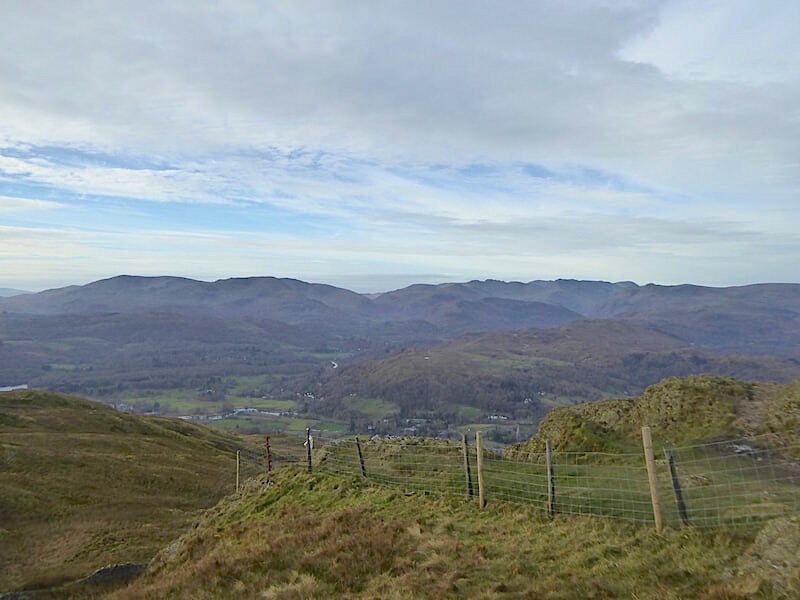 On our left the skies are still relatively cloud free giving us clearer views of Red Screes beyond the wall with the western arm of the Fairfield Horseshoe just behind it. 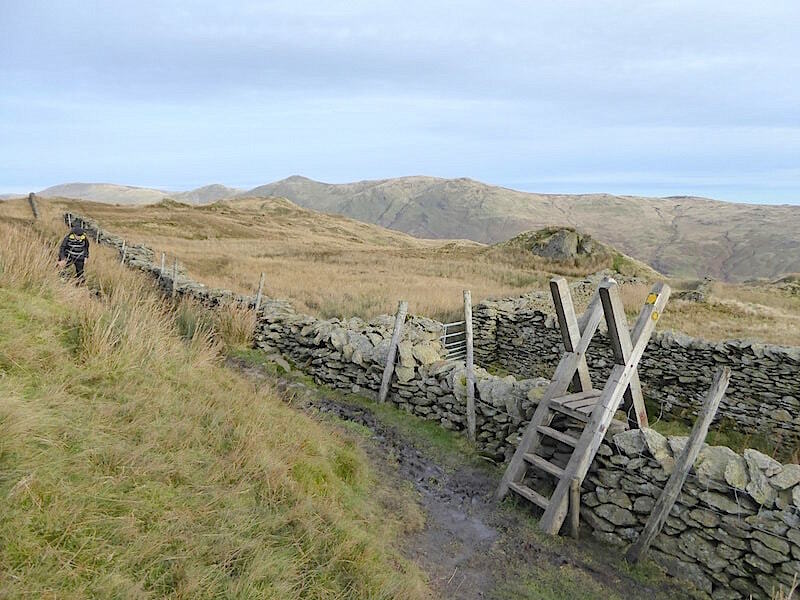 Crossing the stile, the top of which …..
….. offered the chance to see over the wall for this view looking towards Red Screes on the centre left with Caudale Moor to the right of it. 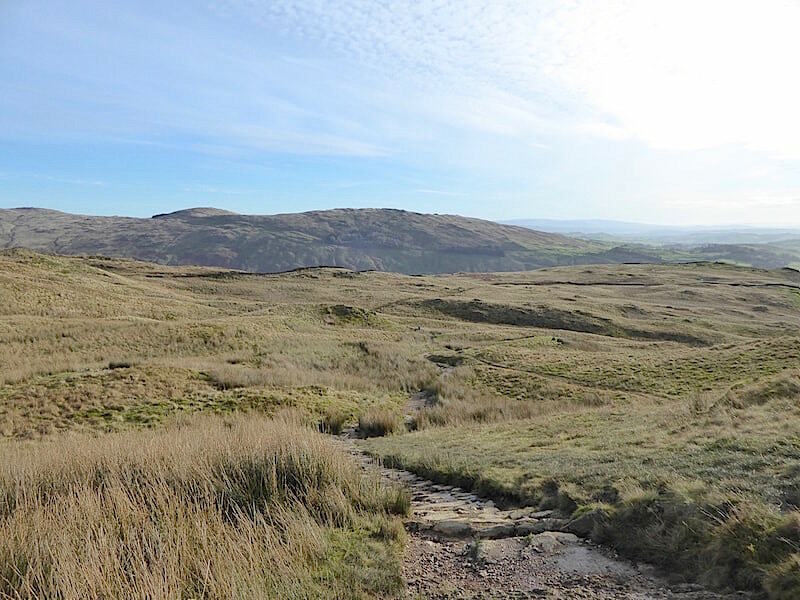 On we go across the assorted humps and bumps of the ridge and eventually Baystones comes into view with a pair of walkers making their way towards it. Behind us there is a greater build up of light cloud so the colours are much more muted now. 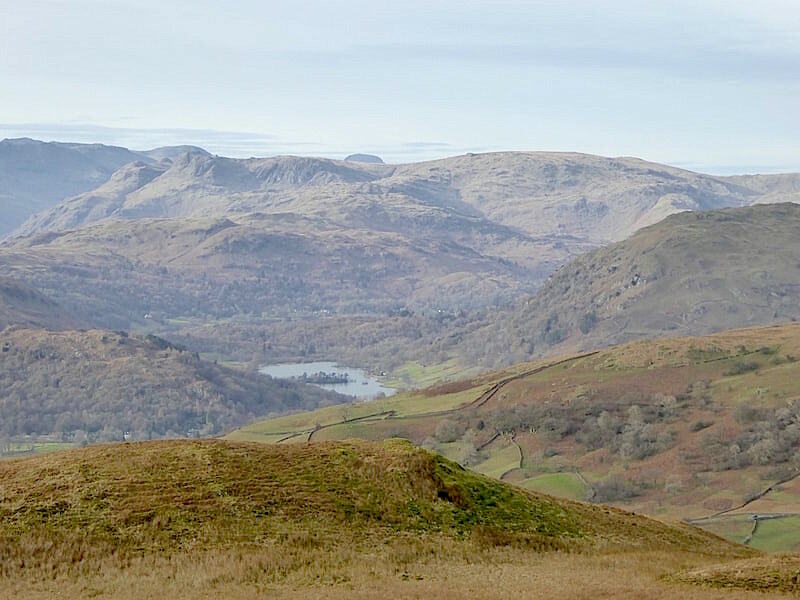 The sunlight filtered through a hazy gap in the cloud and provided a clearer skyline view of the Langdale Pikes all the way across to Sergeant Man and High Raise with Rydal Water below them. 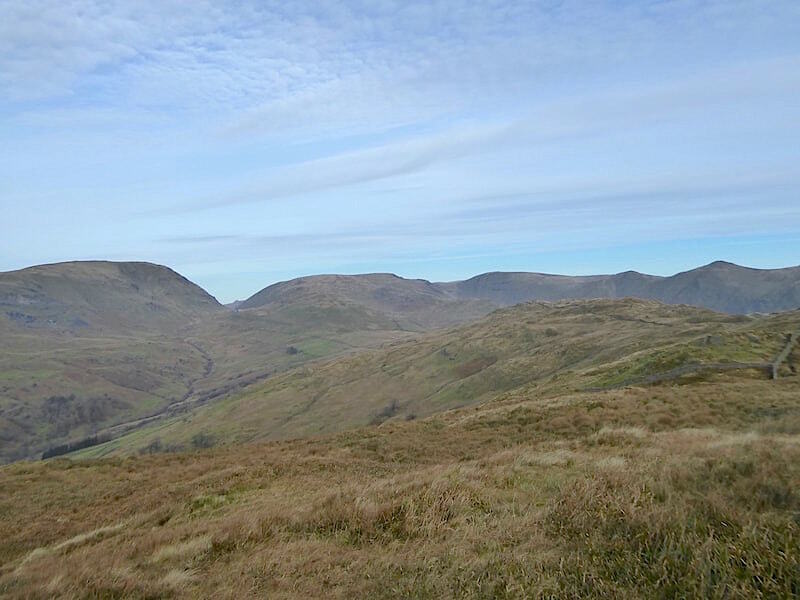 The upturned bowl shape peeping out above the centre is the top of Great Gable. We settled ourselves on a sunny little ledge on the eastern side of Baystones summit to have something to eat. We were very quickly joined by this uninvited, but very entertaining, guest who was obviously very well used to humans sitting down to eat around here. 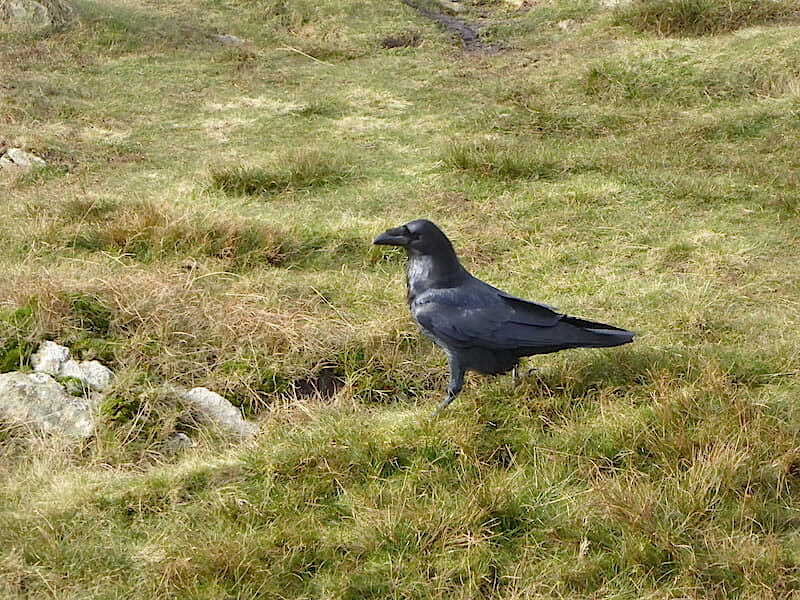 It landed on a rock about six feet away from us and began to look on enquiringly. Head cocked to one side as if to indicate that it was time for a tear and share lunch party and wasn’t it about now that something tasty should have been coming its way. We relented, lobbed a piece of ham and cheese sandwich onto the grass in front of it and down it came. After a couple of seconds inspection it was deemed good enough to eat and down it went. It then proceeded to call out as if asking for more so we went through the routine once again with a bigger piece this time. This was rather too much to manage in one go so it was taken back to the rock where a bit of breaking up had be done before it could be consumed. 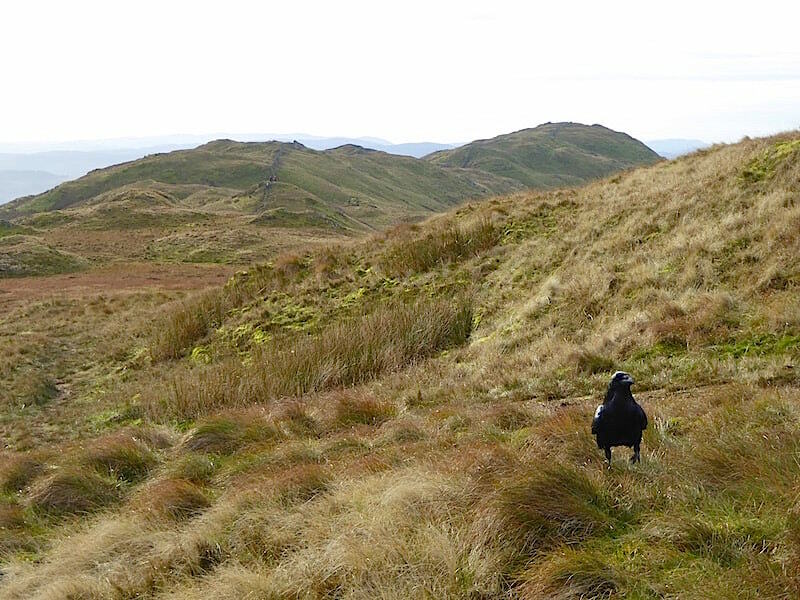 It must scrounge plenty of food up here because it looked in tip top condition. 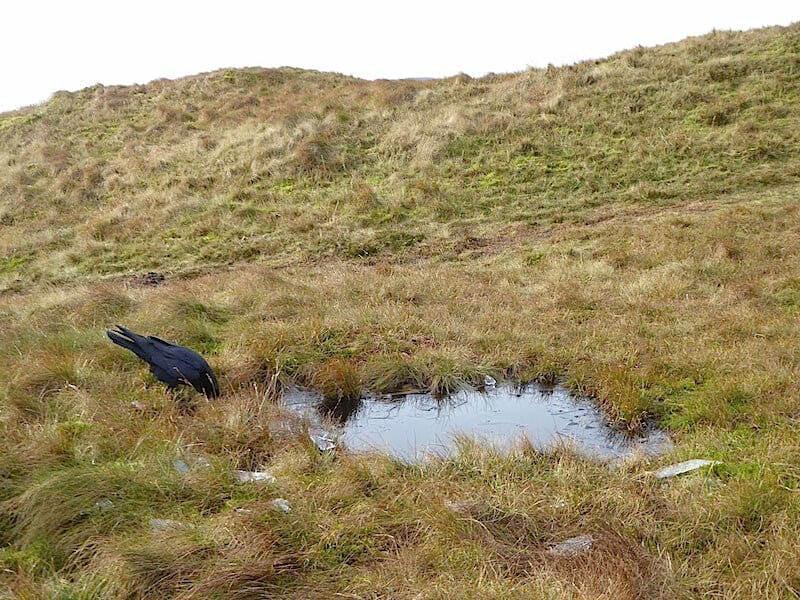 The raven came around towards me but by this time we had nothing left to offer it …..
….. so it made its way to this little pool just behind us to wash down the sandwich with a couple of slugs of ice cold water. An earlier walker must have removed the pool’s surface layer of ice and smashed it to the ground leaving pieces of ice strewn around the grass. 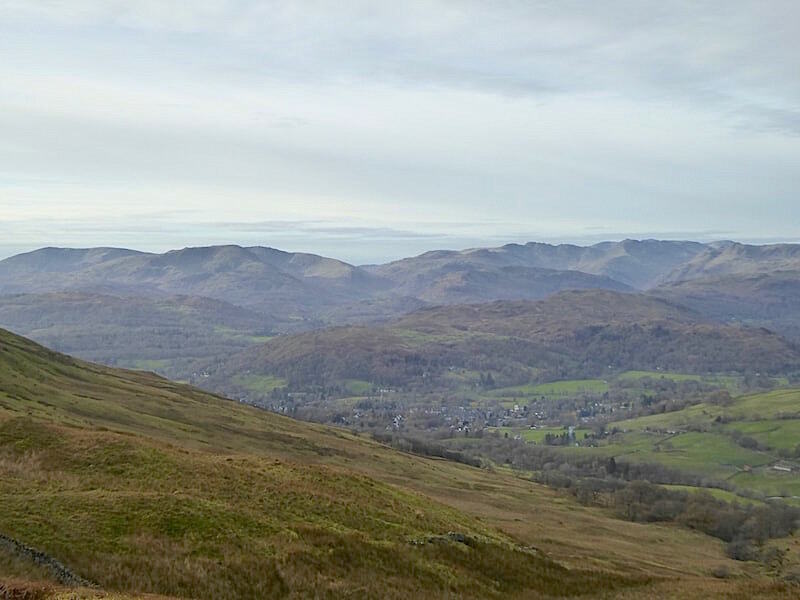 After lunch I took a few shots of the views from Baystones, starting with this one across Windermere, which has a rather mystical quality to it …..
….. while to the east Thornthwaite Crag, Froswick, Ill Bell and Yoke are clearly defined …..
….. as are Sallows and Sour Howes. 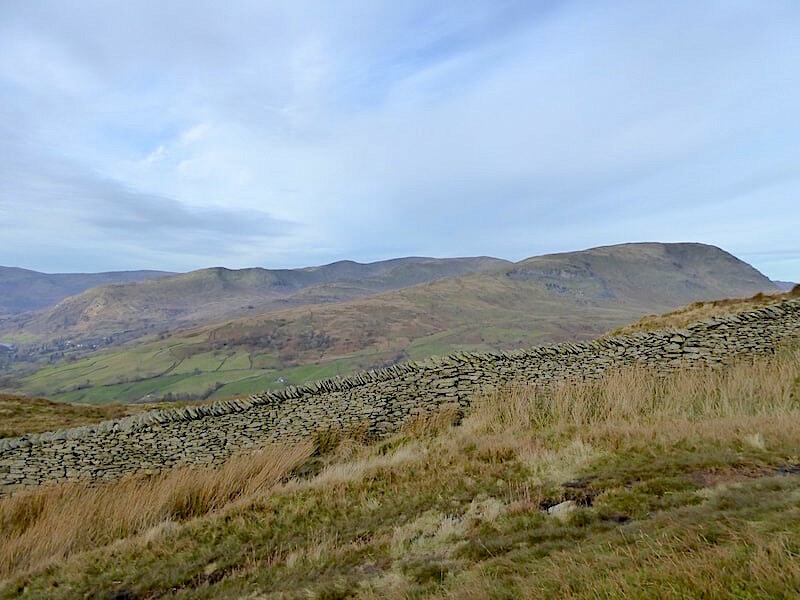 Looking directly north to Caudale Moor, which could be thought of as Wansfell’s parent fell since it stands at the end of Caudale’s long, undulating and uninterrupted southern arm. The best summit cairn shot I could manage since the two walkers who were ahead of us on the path, and so reached Baystones sooner, had decided to have their lunch break beside the path immediately to the left of the cairn. Enjoying the warm sunshine and the still air on Baystones summit. 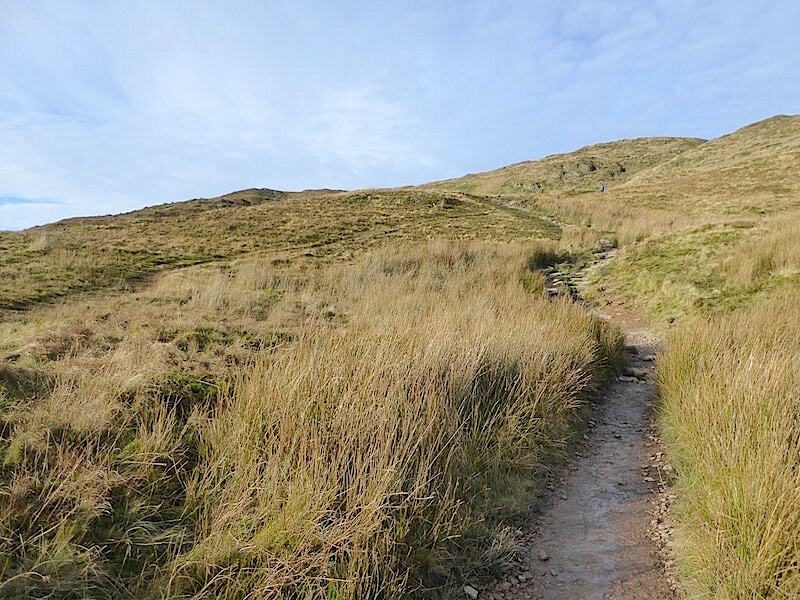 We pack our bags once more and begin to make our way down. More walkers began arriving at the cairn which more or less forced the couple beside the cairn to move out of everyone’s way or get trampled on. 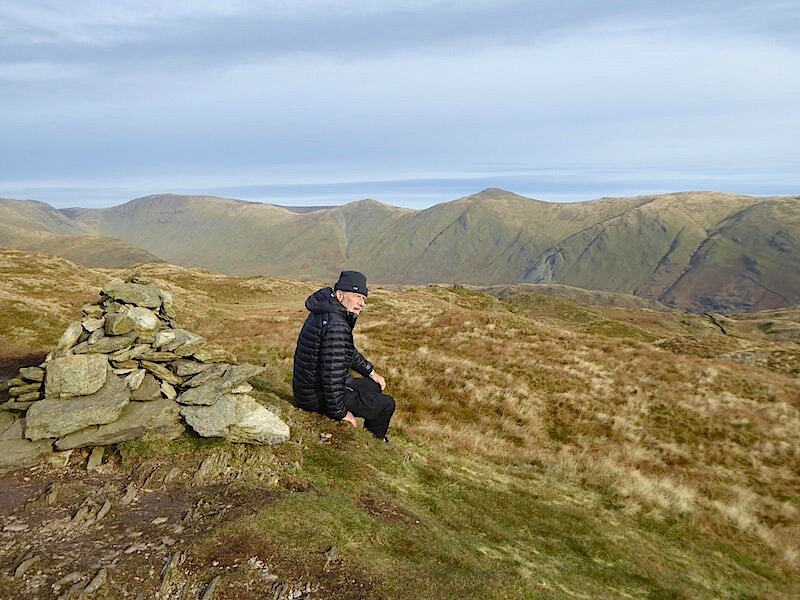 Don’t crowd a summit area if you’re ever out walking, other folks want their summit photo too and they don’t want you, your mates or your packs in it either. 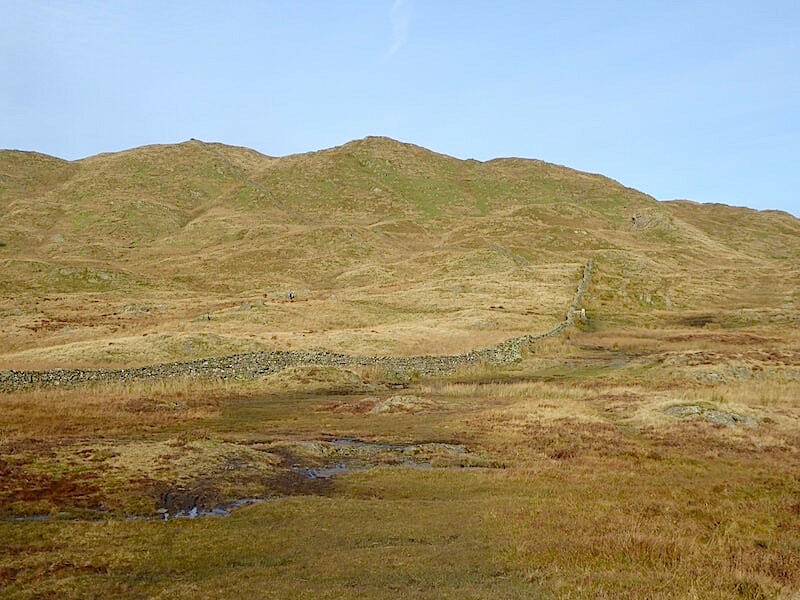 On the way down towards the wall across plenty of squelch now, the sun has been on this side of the fell all morning so whatever was frozen overnight has now thawed out. 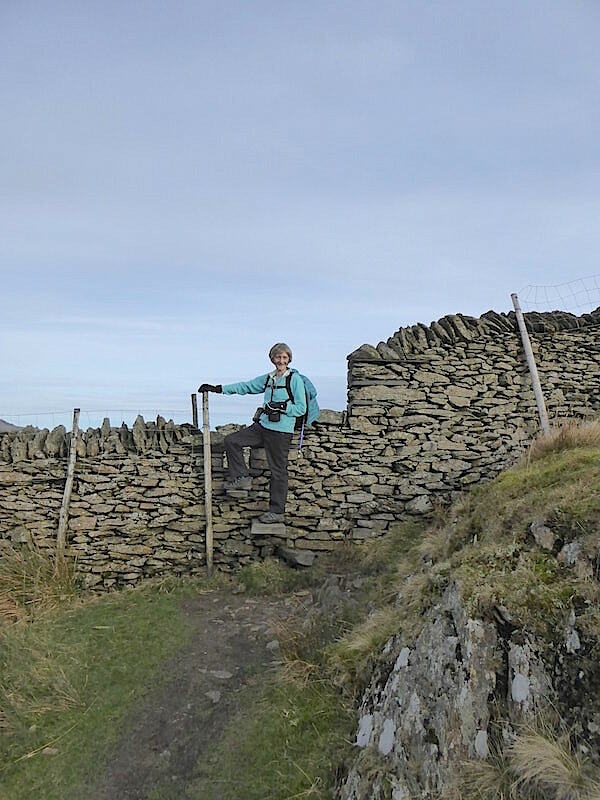 A muddy walk alongside the wall brings us to the stile …..
….. and onto an even muddier and very, very trying, Nanny Lane. We are released from the lane’s muddy clutches when we reach the gate. 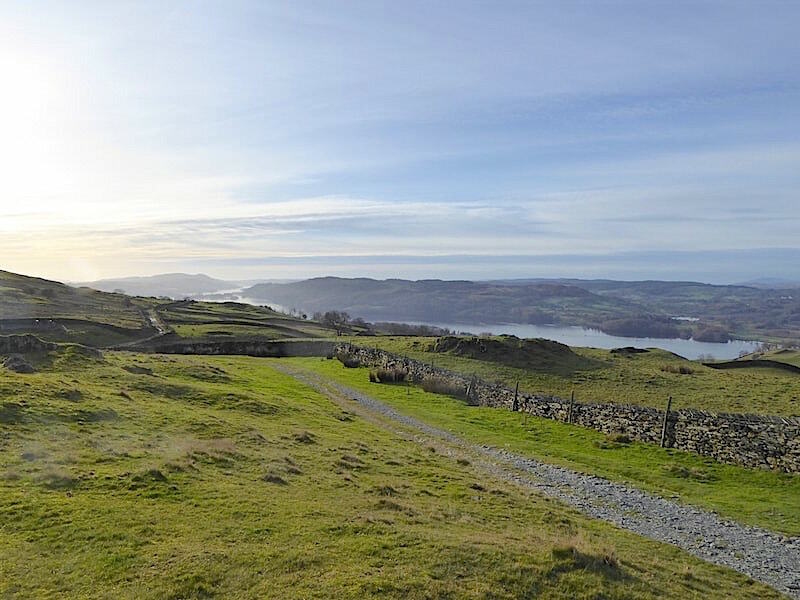 Turn left through the gate for the popular, and usually crowded, path up to Wansfell Pike from Troutbeck, keep straight on for the muddy walk up to the summit at Baystones. There were plenty of people opting for the latter as we made our way down it. 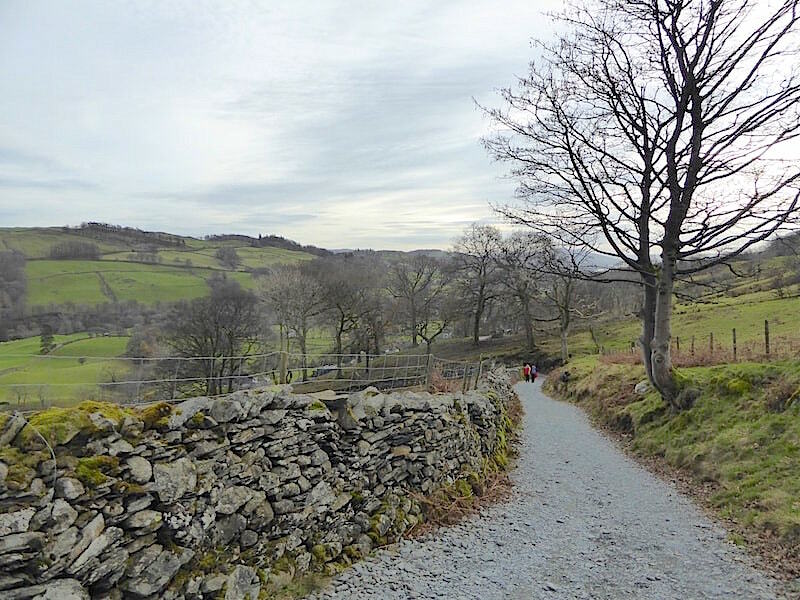 With a good firm footing underneath us we make rapid progress down Nanny Lane …..
….. and we are soon back amongst the charming, and no doubt very expensive, houses of Troutbeck village. Once at the bottom of the lane and back on the road we take a left turn through a wooden gate and follow the little footpath back to the church. Jesus Church at the far end as we cross the field, at the end of which we pass through another gate …..
….. which leads us to the path running alongside the wall surrounding the church. 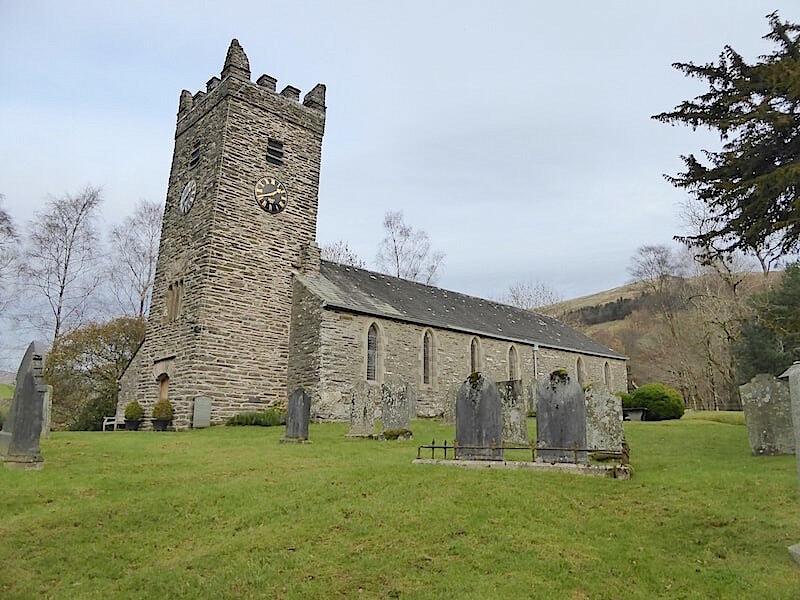 We pass by one of the churchyard entrances and at the end of the path we’re back on the A592 from where its a right turn, past the church and back to the parking area at Church Bridge. Jesus Church and no, the tower isn’t leaning its just my bad photography. A roadside shot that didn’t include parked cars and lots of people was not to be had today so this was the best I could manage. So today’s walk comes to an end here. We’ve had a lovely little ramble in very agreeable weather and have thoroughly enjoyed it. 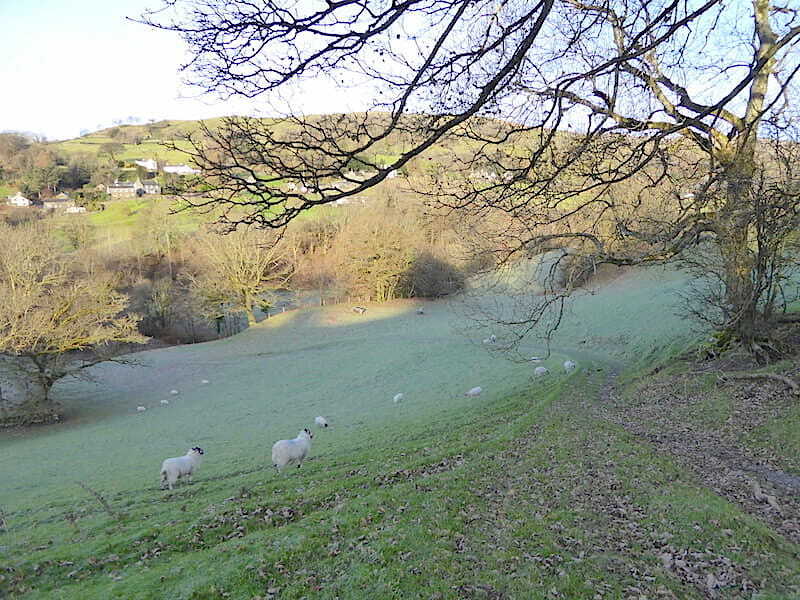 Its a grand little walk for the shorter autumn and winter days.